« It’s National Mentoring Month! What Is Your Memorable Mentoring Moment? When pressed, though, mentees will disclose a variety of topics they’d like to learn about, skills they’d like to develop or areas in which they’d like to improve. You can almost hear the “click” when they realize they can use these as discussion topics with their mentor. Someone just has to ask that question, “What do you want?” That someone can be a mentor, a peer or preferably, oneself. Answering this question is one of the first–and vital–steps in launching a mentoring relationship. That’s not to say that it is an easy question to answer, though. I have a tough enough time answering that question when it’s time to plan dinner, let alone thinking about what I want from my career and how a mentor could help! Luckily, there is a wealth of resources out there to help you get started in setting your mentoring goals. While many of these were devised for postdocs and early career researchers, the concepts apply to any field. A few quick steps can help any mentee get started down their mentoring journey. Sound trite? It is. But that’s about as basic as it gets. You must know this about yourself before you can reap the benefits of mentoring. For postdocs, this might be an easy question to answer, as they have a definite need to get to some next stage of their careers. Mentees at other career levels might have to ponder this a little more. But, what if you don’t want to “go” anywhere? That’s okay. Maybe there are things you’d like to work on to grow professionally and personally in your current role. Common topics mentees seek to work on with their mentors often include communication skills, leadership skills, networking, work/life balance, learning organizational culture and management skills. Researchers may prioritize discipline-specific skills that will help them become independent–proposal writing, lab management, publishing, collaboration. Whatever comes to mind, write it down. How confident are you with your communication skills? Does writing grant proposals or publications scare you under the table? How much do you know about managing budgets or directing the work of others? While the last three were developed for researchers, they cover global transferable skills such as management, communication, leadership, networking, and managing conflict. Or, maybe you want to be more effective at networking. After your self-assessment, you seem pretty confident with your ability hold technical conversations with colleagues in your field. You are aware that your field is becoming more interdisciplinary and want to adapt and grow in this direction. Talking to people in other fields is a mystery to you, though. You might consider starting your next mentoring conversation by asking your mentor to talk about his or her journey and how they’ve met people and built relationships throughout their career. Quick guide for planning mentoring meetings. Click on image for link to table in PowerPoint. 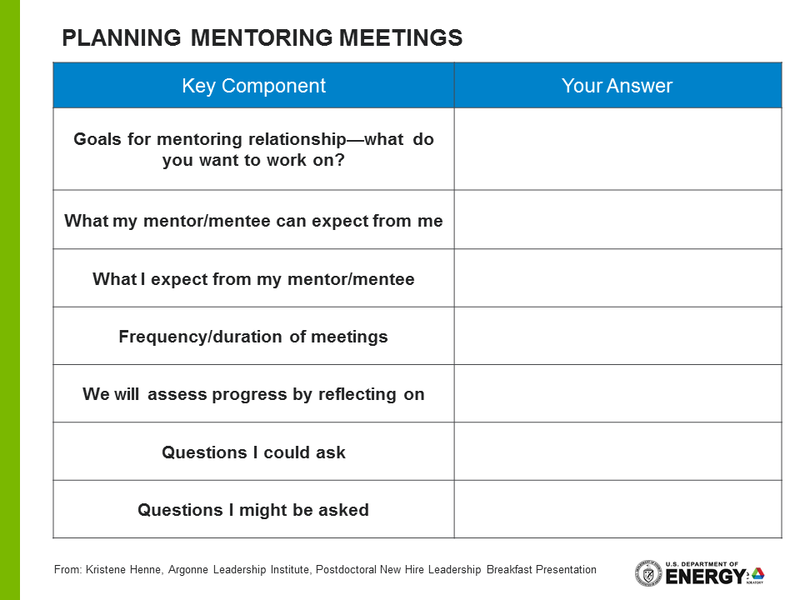 Take this information–your goals, assessment, potential starter questions–and plan your next mentor meeting. And don’t just plan, schedule the meeting and go! A little bit of planning can go a long way in achieving your mentoring goals. As you can see, questions are just as important in starting the conversation as they are in continuing the conversation! What’s a Mentor/ee to Do? Great answer to a common concern. A concern that often results in the mentoring partner not meeting with the mentor. Fewer meetings typically result in a less valued relationship and missed opportunities for both the mentor and mentor partner.